Inter-Switch Link (ISL) protocol, is a cisco proprietary protocol, Can only be used for interconnection between Cisco network equipment, it is mainly used for maintenance the VLAN information such as the traffic between the switches and routers. VLAN is a kind of agreement for solving the problem of Ethernet radio and safety. After the introduction of VLAN, the host to communicate across the switches in the VLAN. We all know that cascaded FCP/FICON directors use ISLs to connect the directors. In certain configurations, ISLs can be grouped or aggregated, typically for performance and reliability. Brocade calls this an ISL trunk (frame-based trunking), and Cisco calls this a Port Channel just as 8 way DWDM module. We will generically call this feature ISL trunking or just a trunk. Each vendor might implement these trunks in a unique way to provide proprietary features. The vendors’ trunks ISLs might contain proprietary frames, proprietary frame formats, or special characters or sequences of characters in the inter-frame gaps. Often, the difference between a cascaded environment contained in a signal data center or campus environment, and one in a metro environment, is the use of a DWDM Optical Amplifiers to carry the ISLs over the extended distance. The primary concern when attempting to use trunked ISLs with a DWDM is that the ISL data streams must be unaltered by the DWDM for the proprietary functions to work correctly. This os sometimes called bits in, bits out, to indicate that there is no change to the signals, especially between the cascaded directors. The challenge with non-symmetric transit times for the ISLs in a trunk is illustrated in following picture. The scale is time to arrive and not distance traversed per time unit (which would produce a great roughly the opposite of this). This diagram shows how the signals, sent at the same time on parallel ISLs, could arrive at the endpoint at different times. The director measure this difference at the time that the trunk is created. The difference is called skew. The director can accommodate a small skew, but an ISL with skew that is too large might be removes from the trunk by the director. An ISL that is carried on circuitry that introduces variable skew will not be detected, because the director does not re-measure the skew. If the variance of the skew becomes too large, the traffic on the trunk could be the cause of interface control checks (IFCCs), or could experience out-of-order frames. It must be noted that the trunks between cascaded directors might appear to work without any issues during testing, because this is often performed with a relatively low I/O load. At that point, only oe or two ISLs in a trunk carry traffic with high I/O loads. Some DWDM Equipments features can cause the skew to vary (that is, not be consistent), which can cause out-of-order frames or other issues with the I/O traffic. Any alteration of the data stream introduced by circuitry or software in the DWDMs might affect the ISLs. The DWDM vendor might alter the data streams for different purposes. You should check with the DWDM and the FICON director vendors to determine basic ISL compatibility. Some of these features might be implemented in a way that alters the data stream that will not affect a single ISL, but would affect trunking. In general, these DWDM features should not be used on trunked ISLs. IBM has experience with DWDMs that could not be used for ISL trunks because of the issues noted, and some experience where ultra DWDM appeared to support ISL trunking. There are many features on each DWDM and on each FICON director, giving a large number of permutations that would be difficult to test. For a single example, and definitely not to provide an exhaustive test, Fiberstore tested a specific configuration with two Brocade FICON Directors whose trunked ISLs were carried on two ADVA FSP 3000s at a distance of 80 km. The test configuration, with significant and varying I/O load, did not find significant increases in IFCCs or out-of-order frames, and the skews between the ISLs in the trunk were within acceptable limits. This entry was posted in WDM Optical Network and tagged CWDM DWDM, DWDM channels on June 28, 2014 by Admin. Fiberstore offers a number of WDM Optical Networking solutions that allow transport associated with a mix of services up to 100 GbE over dark fiber and WDM networks providing for the whole set of probably the most demanding CWDM and DWDM network infrastructure needs. Because the physical fiber optic cabling is expensive to implement for every single service separately, its capacity expansion using a WDM is a necessity. WDM is a concept that describes combination of several streams of data/storage/video or voice on the same physical fiber optic cable by utilizing several wavelengths (or frequencies) of light with each frequency carrying a different sort of data. There’s two types of WDM architectures: CWDM (Coarse Wavelength Division Multiplexing) and DWDM (Dense Wavelength Division Multiplexing). CWDM systems typically provide 8 wavelengths, separated by 20 nm, from 1470nm to 1610nm. 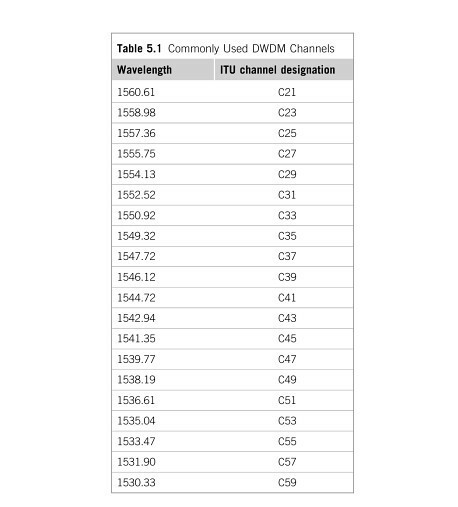 In order to increase the number of wavelength, it’s possible to also use the 1310 nm window therefore the CWDM channels can be increased to 16. Some DWDM network systems provide up to 96 wavelengths, typically without any more than 0.4 nm spacing, roughly over the C-band range of wavelengths. 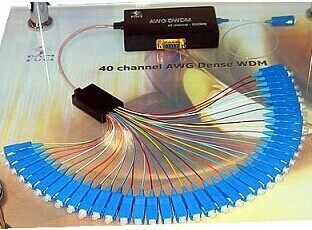 CWDM proves to be the initial access point for many organizations due to its lower cost. Each CWDM wavelength typically supports as much as 2.5 Gbps and could be expanded to 10 Gbps support. This transfer rates are sufficient to aid GbE, Fast Ethernet or 1/2/4/8/10G Fibre Channel, along with other protocols. The CWDM is limited to 16 wavelengths and is typically deployed at networks as much as 80 km since optical amplifiers can’t be used due to the large spacing between channels. 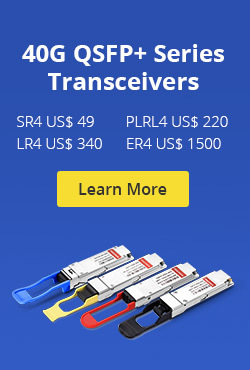 Note: Fiberstore’s WDM optical networking goods are designed to support both CWDM and DWDM technology by utilizing standards based pluggable CWDM Transceiver/DWDM Transceiver such as SFP, XFP and SFP . The technology used is carefully calculated per project and according to customer requirements of distance, capacity, attenuation and future needs. 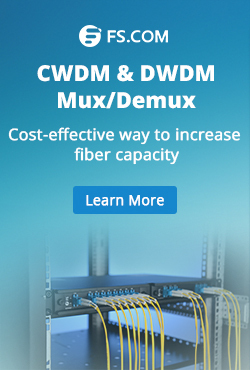 The main benefit of CWDM is the price of the optics that is typically 1 / 3 of the price of the equivalent DWDM optics. This difference in economic scale, the limited budget that lots of customers face, and typical initial requirements to not exceed 8 wavelengths, means that CWDM is a popular entry point for a lot of customers. With Fiberstore’s WDM equipment, a customer can start with 8 CWDM wavelengths however grow by introducing DWDM wavelengths in to the mix, utilizing the existing fiber and maximizing roi. By utilizing CWDM and DWDM network systems or the mixture of thereof, carriers and enterprises are able to transport services as much as 100 Gbps of data. Additionally, the normal CWDM spectrum supports data transport rates as high as 4.25 Gbps, while DWDM is utilized more for large capacity data transport needs as high as 100 Gbps. By mapping DWDM channels inside the CWDM wavelengths spectrum as demonstrated below, higher data transport capacity on the same fiber optic cable is possible without any requirement for changing the existing fiber infrastructure between the network sites. 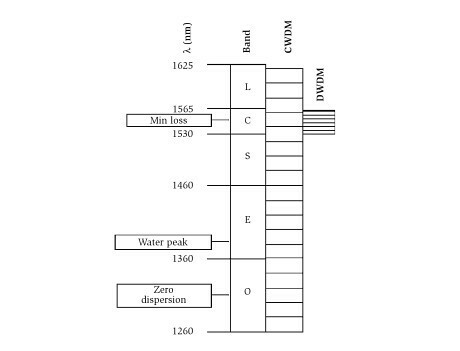 As demonstrated through the figure beside, CWDM occupies the following ITU channels: 1470 nm, 1490 nm, 1510 nm, 1530 nm, 1550 nm, 1570 nm, 1590 nm, and 1610 nm, each separated from the other by 20 nm. Fiberstore can insert into the of the 4 CWDM wavelengths (1530 nm,1550 nm,1570 nm and 1590 nm), a set of additional 8 wavelength of DWDM separated from one another by only 0.1 nm. By doing so up to 4 times, the CWDM network capability can easily expand by up to 28 additional wavelengths. With Fiberstore’s compact CWDM solutions, you could get all of the above benefits and much more (such as remote monitoring and setup, integrated amplifiers, protection capabilities, and integration with 3rd party networking devices, etc.) inside a cost effective 1U unit, enabling you to expand as you grow, and utilize your financial as well as physical resources towards the maximum. Fiberstore’s full scale WDM product suite is ideal for not only services providers, but additionally dark fiber developers, data centers, financial institutions, campuses and enterpirses. Our WDM optical networking goods are supported and implemented by partners, distributors, VARs and customers all over the world. This entry was posted in WDM Optical Network and tagged CWDM Transceiver, CWDM wavelengths, DWDM channels on May 26, 2014 by Admin.